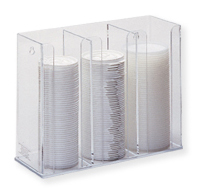 This cups dispenser has 3 dispenser compartments and may be used to display any combination of cups or lids. The cup dispense can be mounted on the wall or displayed on the countertop. This Cups Dispenser offers a Useful way to present your items. Made of clear Acrylic, this Countertop Food Service Dispenser is an exceptional value. Buy Cups Dispenser now - Use our convenient shopping cart or give us a call and place your order with a knowledgeable service representative today!